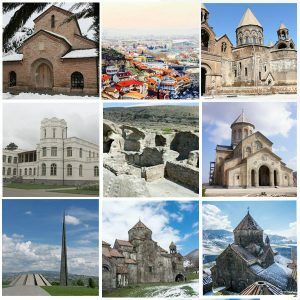 Starts and ends in Yerevan – the capital of Armenia. 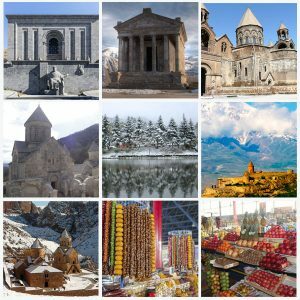 This is a 5 day/4 nights tour to Armenia to explore one of the ancient countries of the world. 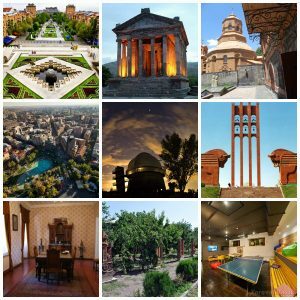 Explore Yerevan then visit the pagan temple of Garni, the Geghard Monastery, the Echmiadzin Cathedral and the resort town of Dilijan. 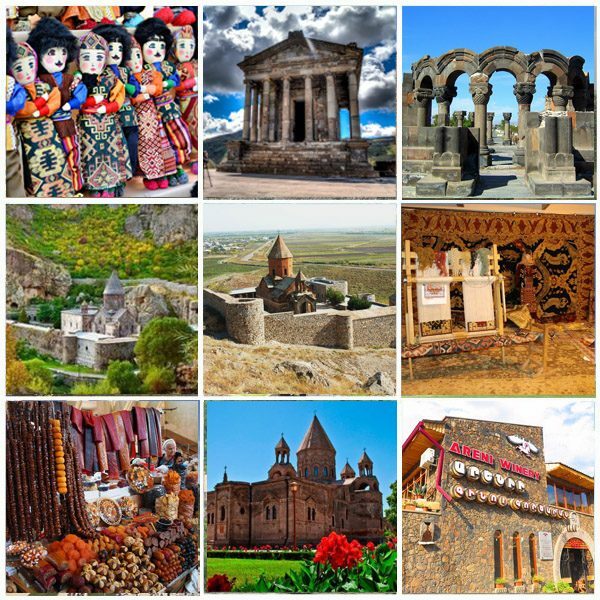 Visit UNESCO World heritage and archeological sites, learn about culture, history and architecture, sample delicious Armenian cuisine and a variety of locally produced wines. 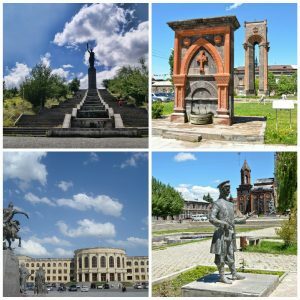 Yerevan city guided walking tour. 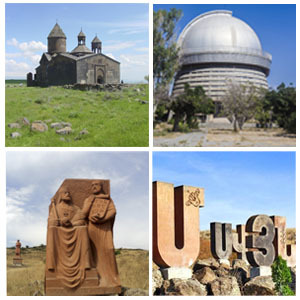 Travel to city of Echmiadzin. 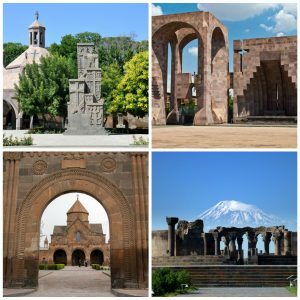 Visit The UNESCO World heritage sites of Echmiadzin Cathedral – the Mother church of the Armenian Apostolic church, the 7th century St.Gayane and St.Hripsime churches and the church of Shoghakat (1694). Have lunch at Machanents Cultural Tourism and Art Center in Echmiadzin and continue to archeological site of Zvartnots, another UNESCO heritage site and one of the exquisite landmarks of medieval Armenian architecture. Travel to the village Garni. Visit the Temple of Garni – the only Greco-Roman collonaded building constructed in the first century AD. View the ravine of the Azad River and the Geghama mountains from the edge of the temple. Continue to Geghardavank Monastery Complex (“the monastery in the cave”) founded in the 4th century by Gregory the Illuminator. Return to Yerevan. Travel to Lake Sevan – the largest freshwater alpine lake in Eurasia set 1,900m above the sea level. Continue to resort town of Dilijian called the “Armenian Switzerland” by locals. Visit Noraduz cemetery to see the largest number of cross-stones dated back to the 10th century. Return to Yerevan. 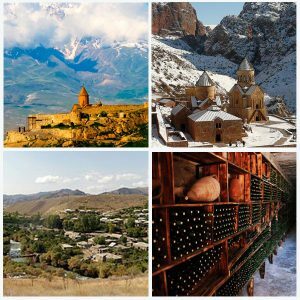 Travel to Khor Virap (meaning “deep dungeon”) monastery and pilgrimage site to learn about Gregory the Iluminator then on to Noravank – the 13th century monastery with ornate architecture. Continue to Areni Wine factory to enjoy wine tasting followed by lunch at the newly established restaurant located on the premises of the factory. Return to Yerevan. Visit Megeryan Carpet Museum to see beauliful Armenian handmade carpets, learn the history of carpet weaving and watch weavers work on their patters. Walk to Vernissage open-air craft market to find modern and Soviet era suvenirs and gifts for you and your loved ones. Coninue to GUM market (local food market) to choose from an endless variety of dry fruits, sweet “sudjukh” (a string of syrup coated walnuts), “Alani”(dry peaches stuffed with walnuts) and many more. Departure. Transfer to Zvartnots International Airport.